After former NBA 3-point legend Ray Allen retired in November 2016, the two-time NBA champ picked up something he’d started more than two decades ago: to study, raise awareness, connect cultural lines and advocate for Holocaust history. It all started at the University of Connecticut in 1993, when a young Allen developed a curiosity about the Holocaust. He began to frequent the U.S. Holocaust Memorial Museum in Washington, D.C., and his education there fueled a full-on passion project. Now he has chosen to lead by example. He encourages those close to him, and anyone who will listen, to learn about Holocaust education through his dedication to the cause. And now the 41-year-old former shooting guard is on the governing board of the museum where he first found his cause. 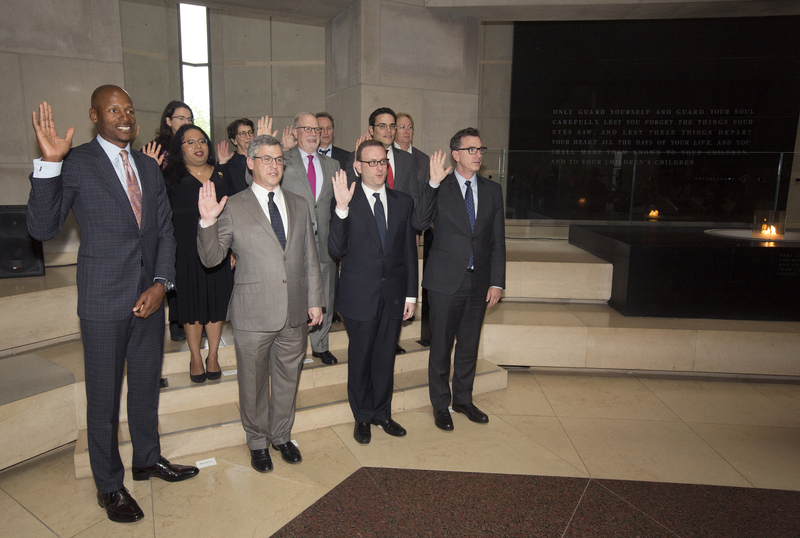 Officially sworn in Tuesday, four months after being appointed to the position by President Barack Obama, Allen raised his right hand and took the council member’s oath in a ceremony at the museum during Days of Remembrance, the nation’s annual commemoration of the Holocaust. Allen wants to show others that cultural relevancy is shared between groups and discussion should not be limited to a single issue. He has visited the museum many times, each time bringing a different friend, teammate or coach. Ray Allen is sworn into the board of directors for the U.S. Holocaust Memorial Museum. The museum is a living memorial to the Holocaust. According to its website, it inspires citizens and leaders worldwide to confront hatred, prevent genocide and promote human dignity. Allen was selected fifth overall in the 1996 NBA draft by Milwaukee, where he stayed until 2003. He went on to play for the Seattle SuperSonics, Boston Celtics and Miami Heat, winning championships in 2008 with Boston and in 2013 with Miami. He polished his game and became the NBA’s all-time leader in 3-point field goals. The 2000 Olympic gold medalist also once took his game to the big screen, starring in the 1998 Spike Lee film He Got Game. Also a 10-time NBA All-Star, he founded the Ray of Hope Foundation in 1996. The nonprofit organization’s mission is to “assist with sports-related, community-based programs and provide avenues of opportunity through which our youth can hope to realize their full potential,” according to its website. Allen spoke to The Undefeated about his journey into Holocaust history and education and why he’s now on the U.S. Holocaust Memorial Museum Council. How did you first become interested in the Holocaust? It started in ’93 when I was in college. I knew about the Holocaust, but I didn’t actually understand the players. Everything was like a shock to my system to understand this could take place and people didn’t really do anything about it. It did something to my soul to be more cognizant of people around me. Care more about the next person. In ’98, I was playing for the Milwaukee Bucks and my owner at the time, I came to D.C. to visit him. We were having a meeting in the summer and I had time to kill, and he suggested I come to the museum. And I took a two-hour tour, just got in and out ’cause we had a flight to catch. And, again, I was blown away. I thought, This is a place that everybody should go to. It’s just like one of those things that every kid should go to, every person that [if] you’re in D.C., you should come through this museum. And now, since then, the African-American museum had been built, and I believe the same thing about that museum. Both can teach the same lessons. The one feedback I got from a lot of people: ‘What about slavery?’ I said, ‘This is slavery. This is slavery. There’s so many different acts of genocide and oppression in the history of the world.’ And I said, ‘The Holocaust is a lesson that we all need to learn so it doesn’t happen again.’ So, I took, from that day forward — every year, whatever team I played on — I would bring them to this museum. Like, we sat in this hall, 7:30, 8 o’clock at night after having gone through the museum and people just kind of in reflection of what they’d just seen, this experience, all the atrocities, and it humbled a lot of people. So it put us in a frame of mind that we started understanding that we play games for a living. People are so tied into what we do, and they make it seem like it’s such an enormous event to watch a basketball game and to follow an athlete, but this seems like this is more important. It touched a lot of people. And so, from then on and forward I’ve brought my family here. People just know I always come here. It’s an important teaching tool, and we can never forget the moments that shape up, shape our country and where we come from. Now that you’ve been educated more on this atrocity and the history of blacks here in America, how closely intersected do you think we are? Well, for the longest time I’ve had like this … despair. I don’t know if that’s the right word, but I’ll go with that for now, in relation to Memphis. I had this gut-wrenching feeling every time I went to Memphis. Before I even went there I felt that way. So the very first time I went there, I was troubled. And I went to the Lorraine Motel — like, I just left the hotel and I walked down the street, went to the Lorraine Motel because I needed to see where MLK was killed. 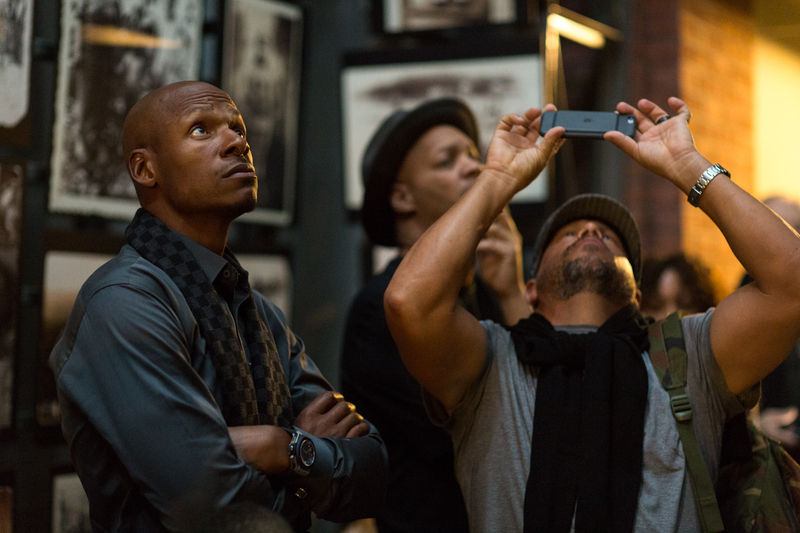 Ray Allen tours the museum in 2008. And so, the whole time it’s like looking at history and trying to understand history and how it played out in my life, even though I didn’t live in that era. Everything he did affected me up to this point where I’m able to play in the NBA and eat at restaurants, walk down main streets of cities, make the money I’m making. Like, this motel is so symbolic for a lot of my life. So the oppression, the racism, the bigotry, what went on during the civil rights movement was everything similar to what happened during the Holocaust, you know, starting back in the ’30s and the ’40s. Between the Jewish people and black people, we’ve been heavily oppressed. One thing that I would love to see, and you start to see it now, more with the building of the African-American museum, is the black culture coming together so we can tell our story. For many years, it was almost like our country wouldn’t accept the bad things it did to black people. The oppression, the racism, just all the negative issues that we’ve dealt with as people, we’re still recovering. So, I think between both museums, there’re opportunities for all of us to learn that each one of us were equal, and you can’t create somebody less than a human. And it’s here in D.C.; they’re examples for every child. The bully starts off in a small fashion, but he could grow into a dictator. All we had to do is walk into one of these museums and you see what the bullies did. How they controlled societies, controlled people, and it gets ugly. How has visiting the Holocaust museum been inspiring for you? You see the names of people who’ve fought, who survived under extreme circumstances. What would I have done in each of these situations, would I have been tough? You get to see great examples of people who are extremely tough, who defied the odds, who survived countless horrors. 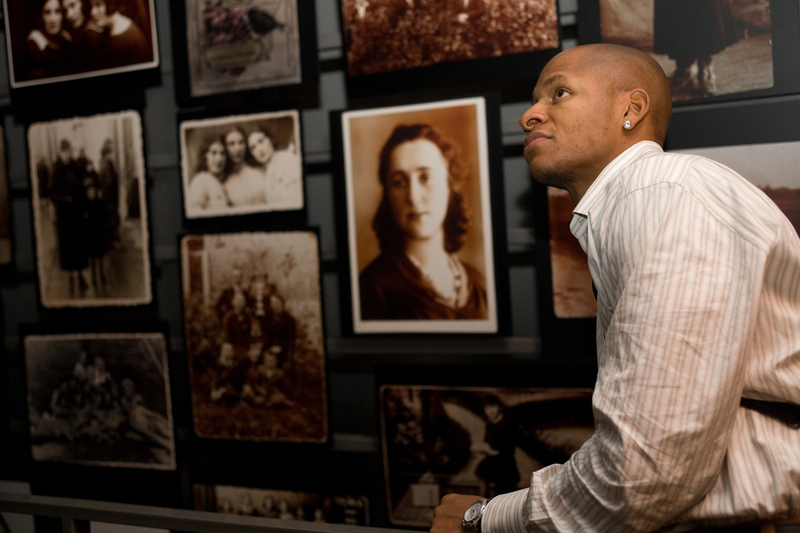 Ray Allen tours the Holocaust Museum with his family. Allen was recently appointed to the Museum Council. Not being able to eat, not being clothed properly — it teaches you to live stronger and not be such a complainer and a worry wart. But then the people who did, they lived to tell their story, and that’s one of the only reasons why we have this building we’re sitting in, because people told the story. How do you feel being the guy to encourage Holocaust history education? Are your kids old enough to understand the work that you’re doing with the Holocaust Museum? I have a 24-year-old, 12, 10, 7, and 5-year-old boys. The world is so small. They have access to everything. I try not to hide the world from them. Because it’s happening right in front of us. I try to just let them experience everything, and then talk to them about it and see how they feel, get them thinking from a spirited perspective. I want my children to be very aware of the world that they’re walking into. How do you think we can integrate more cultural history that’s not our own into our community? It’s just education, it’s just reading. Programs that are put in place that allow kids to read. And read something different. Something that involves your life or something that involves somebody else’s life that teaches you about the world that we live in or we come from. But it’s important that the parents set a mandate to what kids continue to learn. We just can’t rely on our teachers at school to teach our kids. What do you see going forward in your journey? Well, in two weeks I’m going to Poland, so I’m going to Auschwitz. I’ll be firsthand at a concentration camp. I get to walk those grounds and feel exactly everything that I’m knowing, that I’ve seen personally in this museum and heard from survivors and watched in movies. Just to continue to have the conversation and talk to people I know about it. It’s one thing to post stuff on Instagram about things that I have. What was the hardest thing about visiting the Holocaust Museum? It was a lot. I saw a rail car that was bent because they took the bodies of the dead and they burned them on it, and the flames were so hot it just kind of, twisted. Imagine that temperature that’s twisting steel like that. Walk into a room and seeing hair. Walk into a room and seeing shoes. These are actually real people’s items. Like, it’s real. It’s not a prop. This is not even small, like, half of what the inventory is that they have. How did your teammates respond after their first visit? Were they grateful for you bringing them here? The fact that I had the access to be able to get people here, that’s one of the blessings of our reach when you play in NBA, to be able to do things with so many people and show them different places they would’ve never seen otherwise. Each one, teach one. When you do something, great, you take people with you so you could share your experiences.